Cajun Bowfishing Sucker Punch Ready to Fish Bowfishing Kit - Right Handed | BUDK.com - Knives & Swords At The Lowest Prices! Bored with rod and reel fishing and need a way to jumpstart your passion? Interested in prehistoric fishing methods? Do you enjoy bowhunting? Are you alive and breathing? If you answered "yes" to any of these, you've just gotta try the "Sucker Punch" Ready to Fish Bowfishing Kit from the leaders of this exciting ancient sport, Cajun Bowfishing. With everything you need to start bowfishing in one convenient package, there's no need to research, source and buy expensive, often hard to find bowfishing gear. The heart and soul of this handy kit is the advanced (right handed) bow - just 3 1/5 lbs, but, rest assured, it's built for stickin' and whippin' the big 'uns, from carp to alligator gar! It's loaded with fishing-specific features and is designed to let you “hunt” all day with minimal fatigue. The bow's 35 1/4" axle-to-axle length allows for countless hours of shooting without finger pinch, and extra deep cam grooves prevent frustrating string derailment. It boasts a draw specific let-off with a 60 percent median that keeps you relaxed while aiming, thus making you more accurate - especially crucial for bowfishing. The "fishing biscuit" arrow rest won't alter your arrow's flight path and velocity either, so you can trust that well aimed projectiles will always hit their mark. As awesome as the bow is, it barely scratches the surface of the extraordinarily versatile Sucker Punch RTF Kit. 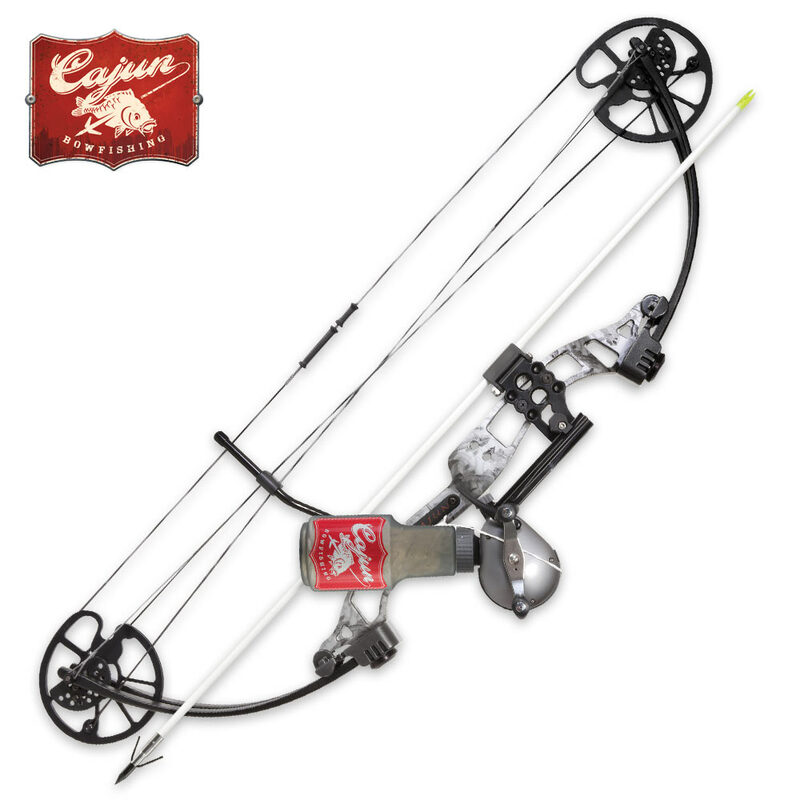 In addition to the bow, the package includes a Cajun hybrid bowfishing reel, Cajun blister buster finger pads and two white fiberglass arrows with Piranha Points. With constant draw and fixed draw options and a host of other great features, Cajun Bowfishing's Sucker Punch kit is truly "ready to fish!"